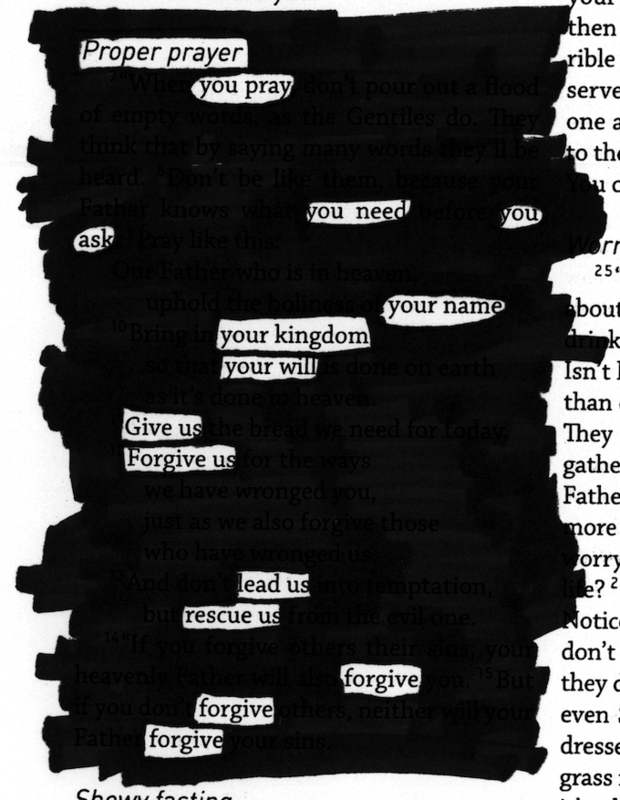 Yesterday I wrote about creating a Bible Blackout, being inspired by the work of Austin Kleon and his Newspaper Blackouts. And I’m always looking for new activities to do at youth group and new ways to get youth interacting with scripture, so it seemed like a pretty good idea. And the youth loved it. Or maybe it was the Sharpie fumes…I’m not sure – but either way – it’s worth doing sometime with your youth, or with any age group in the church. 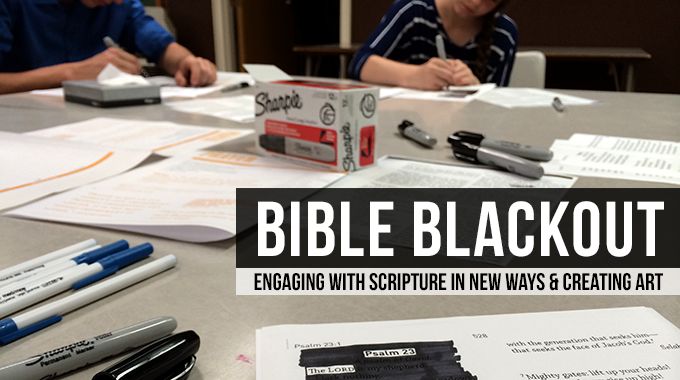 Here’s how I went about creating Bible Blackouts with the youth. Introduction: Our group has done Lectio Divina a few times together, so we were used to the idea of listening to a scripture passage and seeing what words stood out to us. If you haven’t done that before, it might be helpful to give just some brief comments about how sometimes when we read scripture or listen to it, some things stand out to us more than others, or we hang on to some words more than others. Then I gave a little background of Austin Kleon and his Newspaper Blackouts, and how I thought we could do the same thing with scripture – take something that is important and already has meaning, but see what we could create out of it that would be new. And then I gave basic instructions for creating the blackout (put boxes or circles around the words that stand out to you, and black out the rest of the text…it’s pretty simple). Leading the Bible Blackout: Then I passed around the sheets with the scripture on it. I decided to go with familiar passages for this first time of doing it, so I passed around Psalm 23 and Matthew 6:5-15. We took the Psalm first, and we all went around the table, reading the Psalm verse by verse, slowly. 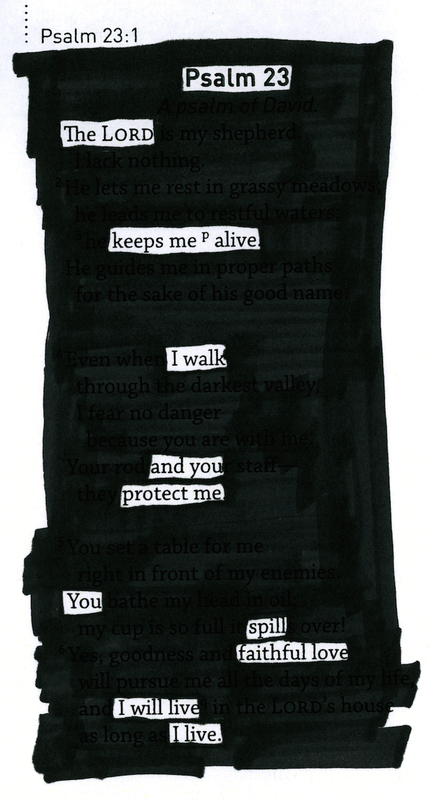 Once we had read the Psalm, we spent about 5-10 minutes going through the text and creating our Bible Blackouts. The youth were really all into it, which was fun for me to see. After everyone had created their Bible Blackouts, we went around the circle and shared what we had come up with, and if there was any reason why we went in the direction we did. It was so cool to hear the different prayers and versions of the scripture that people came up with. Then we did it a second time with the Matthew passage. I think this is such a cool way to get youth (or anyone) to sit down with a passage, to read it carefully, and to see what God might be saying to them through it. In a way, it’s just a different form of lectio divina. And at the end…you’re left with a pretty cool piece of art that you can take with you. I would highly recommend trying this out at your church. Below are the two Bible Blackouts that I came up with last night. I used this tonight with my youth group and it was awesome. Thank you so much!! Yes, this is a perfectly post modern way of studying scripture. As in, if you don’t believe the Bible is God’s inspired, Holy and inerrant Word then you can play with it and make it say whatever you want it to. I have to agree with Heather here. Correct hermeneutics, scriptural interpretation based on fundamental, intrinsic rules of logic and reason is modeling our thinking after the pattern of God’s own mind. We have a moral obligation to model this pattern of God’s thinking based on logic. The black out or cut and paste idea way of reading scripture is really isogesis not exegesis. Isogesis, means to read into a verse something not intended, as opposed to “exegesis” which means to take from a verse the meaning that is there in language and context. Isogesis is really nothing more than introducing one’s own presuppositions, agendas, or biases into the meaning a verse instead of taking out of the verse what the language and writer are actually saying. Shepherding the flock is a serious position that entails higher judgement (James 3:1). We have a High Priest who intends for those who tend to His sheep to do it with integrity. Thus, we should keep the integrity of the Word of God. I had a similar reaction about picking and choosing when I read the title, but the post says that this youth group has practiced reading carefully in order to listen for what God says to them as they read (which is the point of lectio divina — you read with the expectation of hearing God’s voice through what He’s said in the Bible). They started out reading the whole thing and then circled what stood out as they read. It’s an exercise in hearing God’s voice in His living and active Word, not picking and choosing the “agreeable” parts of the Bible. This looks like a really good way of getting kids to really focus on the scripture and draw out what God is saying to them through is. I notice the examples shown are from the Psalms and I think it probably works best them. I’m not completely sure how serious Heathers comment is but it sounds like thinly veiled sarcasm to me. That said I think I would recommend teaching along with this activity the warns young people away from picking and choosing scripture that fits their belief and ignoring others. That said I really like the idea and would certainly give it a god with youth groups I work with. I can understand that “taking away” from God’s word is a bad thing, but I don’t think that’s what he was trying to do here. I know that I’m not the only one who has read a passage from scripture, and then re-read it a few weeks or months later and gotten a completely different message from the same words. Everyone reads something different in each and every scripture based on their understanding of it and the events that are happening in their lives. This exercise simply illustrates that concept. God’s word is fluid and effects everyone differently. I’m going to run this idea by my Senior Pastor and based on his opinion try it with my youth. As I would suggest everyone do, don’t just try or dismiss something because it worked or didn’t work for someone else, get an opinion from someone else whom you trust. So scriptures do mean whatever we want them to mean. Thanks for teaching another group of kids that the Bible can be taken kind of seriously, at least for art. It’s not that they mean what WE want them to mean, it’s that the same scripture can have a different meaning to different people or to the same person who is in a different circumstance in their life. The meaning that we get from it is inspired by God just like the bible itself is. I really like this idea. I would take it one step further and go back and see not only what they got out of it. But did they turn it into something it’s not. That’s excellent teaching! Helping anyone youth or adult understand how they see it and compare to others is a great way to study Gods word. The idea of using a permanent marker to permanently black out God’s words that we momentarily choose to ignore just feel so wrong. Highlighting what God wants to teach you during that particular reading is fine. It’s like only accepting some of His teaching, then closing the door shut on what He May want to highlight for you the next day, as He teaches us.